Your brand colors are the foundation for your business’s visual aesthetic. Choosing brand colors seems simple enough, but it is a deceptively large investment that should be approached carefully. 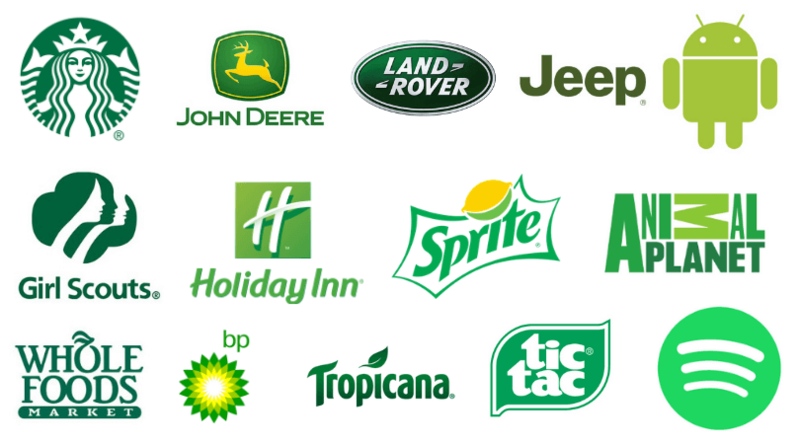 The branding color scheme you choose will be consistently displayed through your logos, websites, advertisements, literature, products, and more. Learning how to pick colors for your brand is more than just identifying complementary colors on a color wheel (more on that later). 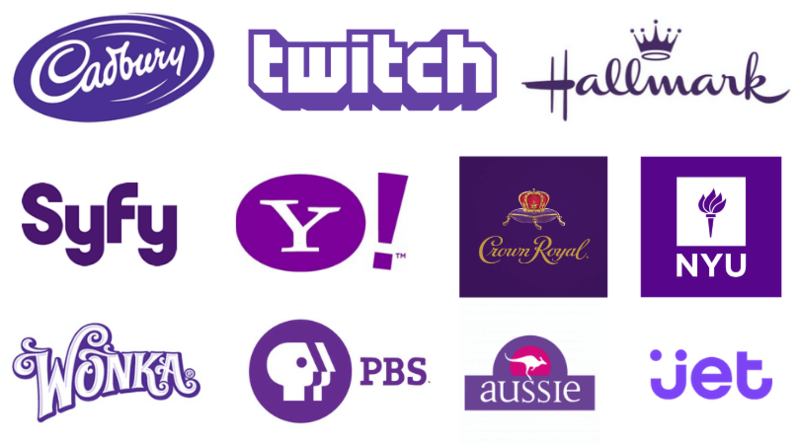 Depending on what your brand is, you want your colors to reflect that personality. The company color scheme you choose will embody the essence of your business. 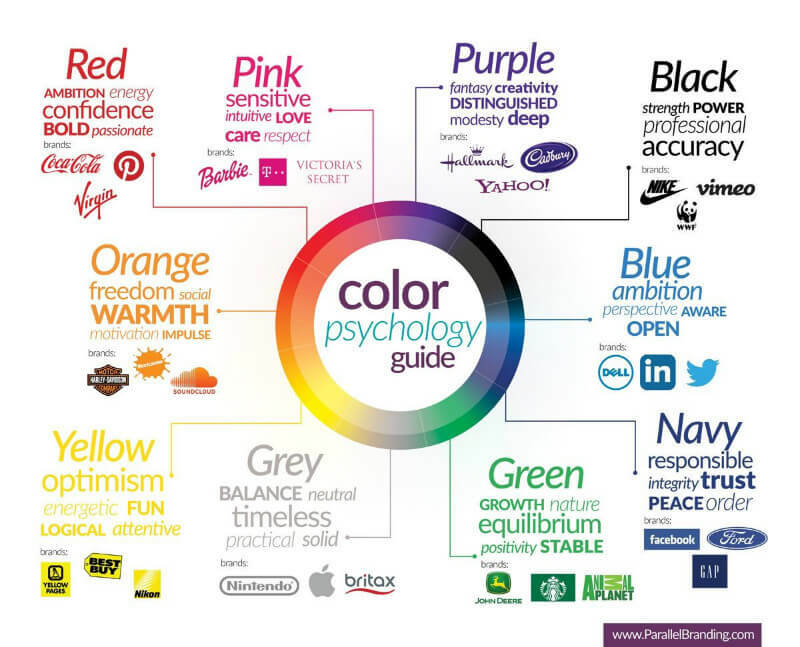 Different colors in branding psychology evoke different emotions, which is why similar companies will use similar colors. For example, fast food companies will use a lot of red to stimulate hunger and to seem exciting and energetic. 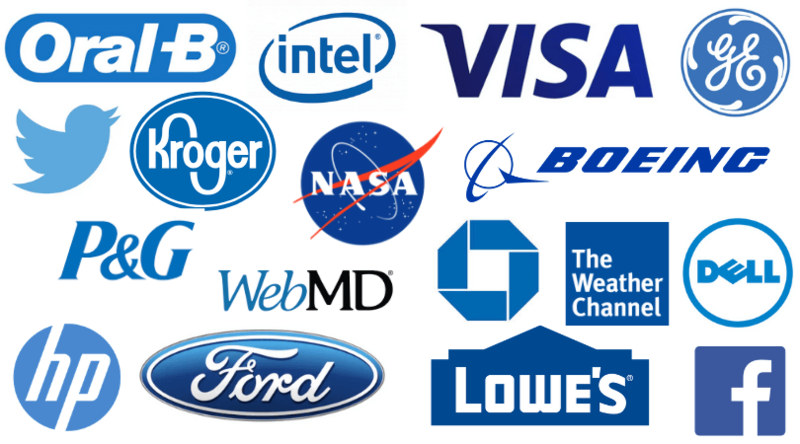 Tech companies use blue to convey trust, security, logic, etc. While the effect of colors on emotions and feelings obviously differs from person to person (and culture to culture), there is a general neurological response toward certain colors that most humans have in common. The meaning of different brand colors can easily be seen when comparing logo colors of various companies (see graphic below). 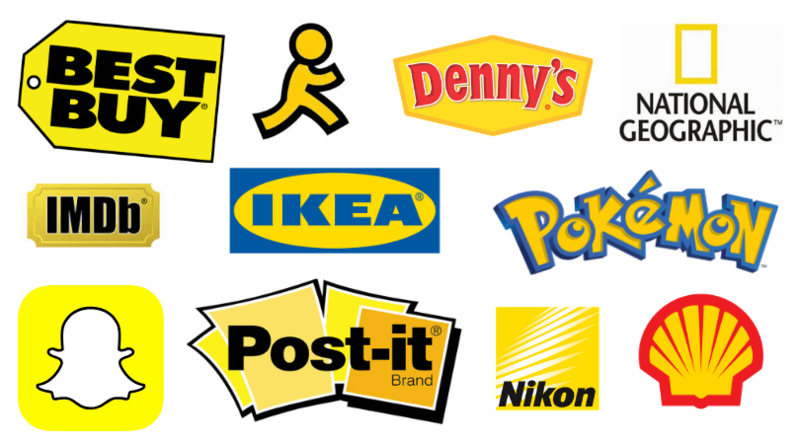 Several companies have been successful with choosing their corporate color schemes to market a certain image. Color psychology is not something to be underestimated, which is why choosing the right color in marketing and branding is extremely important. Now that that’s understood, how exactly do you pick which colors? Do you need help building a better brand? Download this free four step process and create a more powerful brand today! First off, your business should have 1-3 main colors maximum (1-2 is ideal). If your brand was a person, what would its personality traits be? Is your brand fun, innocent, and friendly? Is it happy and creative? These traits conjure up orange or yellow- you wouldn’t want to choose black, gray or brown to represent your brand’s identity. Red is a bold color that evokes feelings of passion, hunger, warmth, anger, energy, romance, and excitement. 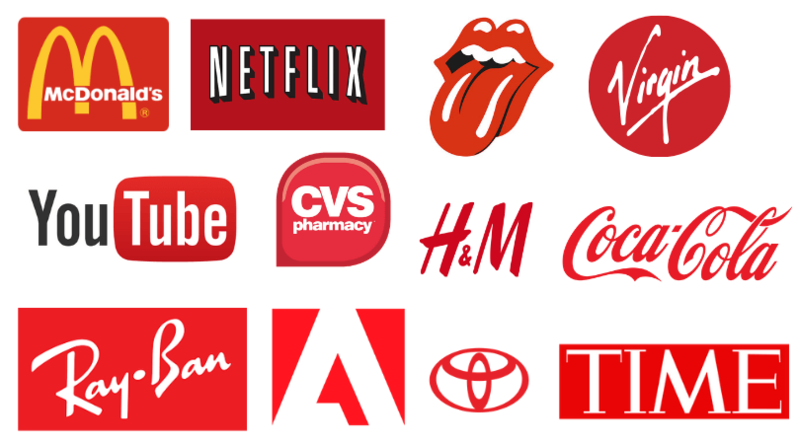 Using red makes a powerful statement and when used correctly, will make your logo pop out from the crowd. Orange is a friendly color that evokes feelings of creativity, warmth, youth, affordability, and playfulness. Using orange lends an active and vibrant feel to your brand. 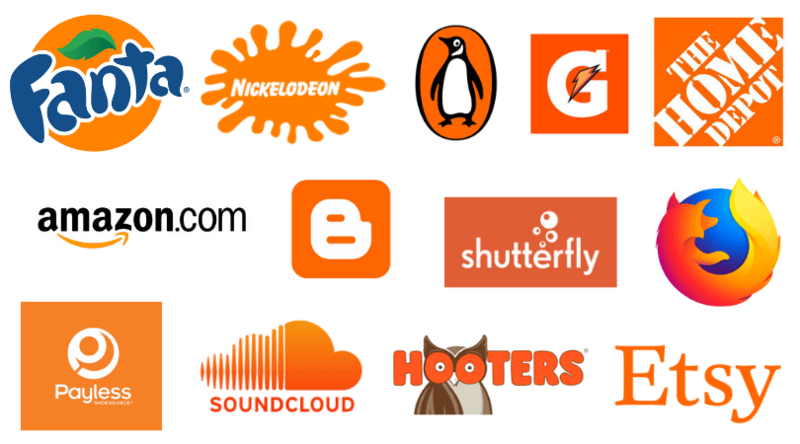 Luxury and traditional brands should avoid using orange. Yellow is a cheerful color that evokes feelings of optimism, happiness, and spontaneity. It can also signify sunshine, gold, or electricity. Yellow can be a risky choice because it is often used in cautionary signs and the wrong shade can look gaudy. However, when utilized effectively it broadcasts a friendly and energetic vibe. Green is often used to signify peace, health, nature, money, freshness, and growth. Green is a natural choice for environmentally-focused brands (or brands that want to appear sustainable). Darker greens are used to convey wealth and prestige. Blue is a calm color often used to express stability, trust, clarity, reliability, communication, and security. 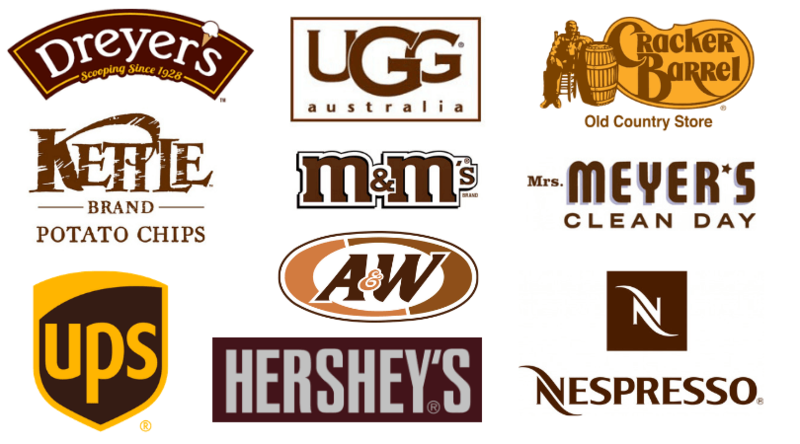 It is the most commonly preferred color in the world and thus, is a favorite “safe” color in logos. Blue can also signify water, skies, and the cold. Purple is a sophisticated color associated with royalty, power, mystery, luxury and imagination. It is a less common color used with brands, so if your brand aligns with this color it’s a good opportunity to stand out! Black is a timeless color that exudes mystery, power, tradition, credibility, authority, elegance, and security. It can signify balance or darkness. If your brand leans more formal or luxurious, don’t write this color off as boring. 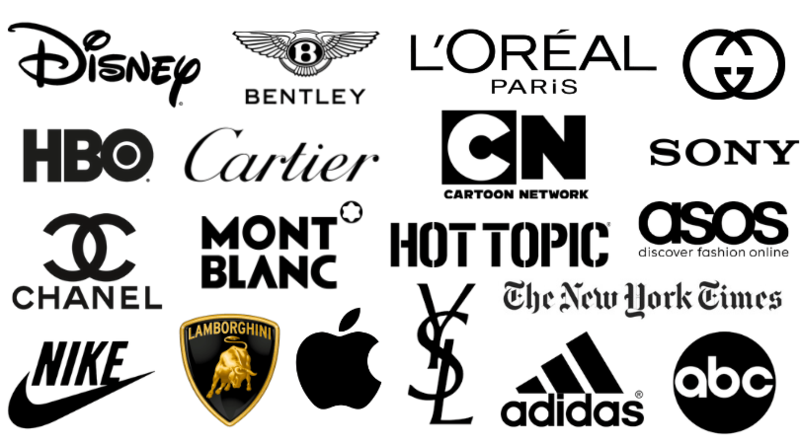 Several retail and fashion brands use black in their logos. 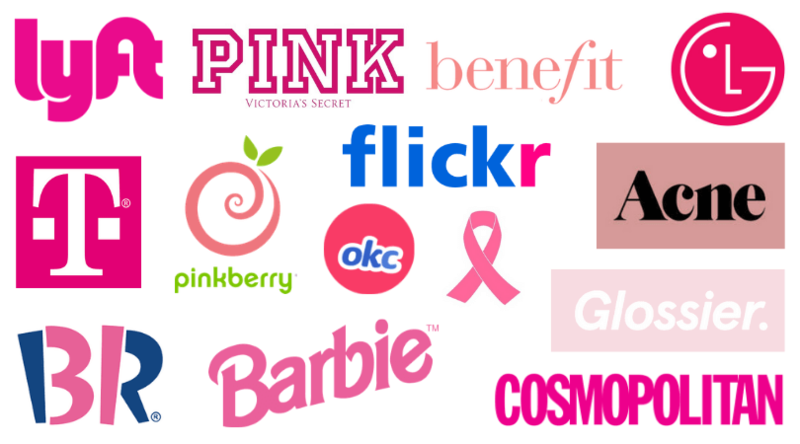 Pink is a sweet and versatile color that expresses femininity, romance, excitement, creativity, passion, and innovation. A softer shade often referred to as “millennial pink” has taken over the marketing world due to its youthful appeal. Bolder pinks and magentas have been used to stand out (like by T-Mobile or as an accent color by Flickr). Brown is a rustic color that is often used in food, beverage, organic, and nature brands. It expresses sturdiness, reliability, authenticity, practicality, wholesomeness, and warmth. It can signify the earth, leather, chocolate, wood or coffee. After choosing your main color, you need to choose your neutral and accent colors. Your neutral colors will be used for things like your text and backgrounds. Accent colors are used whenever you need something to “pop”, like a call-to-action or floating button. When used sparingly, they can immediately draw the eye to an important element. When overused, these bolder colors can quickly clutter a design and make it look jarring. Having a cohesive color palette for your brand makes your marketing materials look polished and professional. 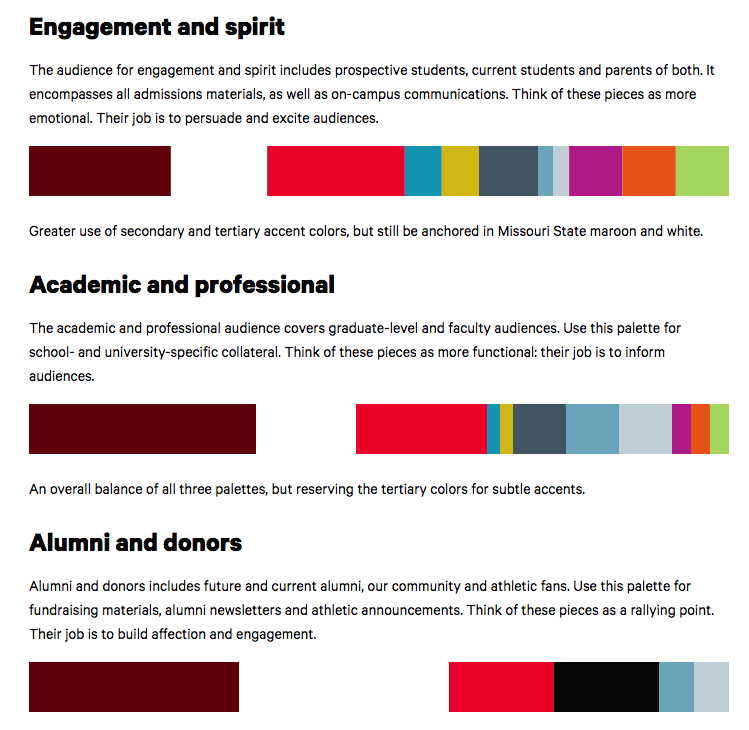 Below, Missouri State University shows how you can mix and match colors to reach different marketing goals while keeping the 60-30-10 rule of having primary colors occupy 60% of the focus. Secondary colors take up 30%, and your accent colors will take up 10%. You can also use a color palette generator to automatically pick a pleasing palette. Some of them allow you to “lock” a color and generate a palette around that color. If you know what your business’s personality traits are but are still struggling to come up with the perfect color, try either one of these color and branding personality quizzes. If you’re in need of professional help, contact the experts at MARION today. Our branding agency in Houston has helped hundreds of companies develop stunning marketing materials and powerfully positioned brands over the last 38 years. After we’ve worked with your team to establish your initial branding material, our award-winning marketing company can provide ongoing monthly services to make sure you’re reaching your target audience.